Team Dyquem! original iPhone applications. Team Dyquem! Original iPhone apps garden. send us an email by this form. You erase cats by connecting four or more cats of similar color together. A sideways cat moves forward automatically. 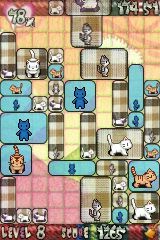 If you're fond of or PUYO-PUYO like funny 3D puzzle game, FELTED CATS 2 will satisfy your heart. 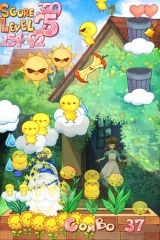 Try juggling and protect your garden and flowers from evil chicks. Internet highscore ranking which is simple, easy, convenient and no sign in. Let's try 3 minutes high speed score attack. 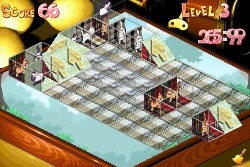 It's gimmick filling of a score challenge in the simple rule. Any time you can suspend and resume! Clap Happy Gardens will satisfy your heart. Professional game programmer Team Dyquem presents. *You erase cats by connecting four or more cats of similar color together. *A sideways cat moves forward automatically. *Let's try 5 minutes high speed score attack. FELTED CATS will satisfy your heart. 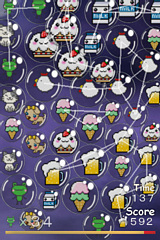 High speed cats action game in Alice like and cinematically music. A cat shoots with a bow the cocktail glass. Nata De Cat will satisfy your heart. 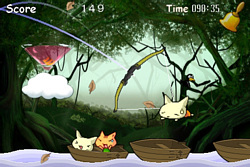 High speed cats action game in Japanese style with Japanese taste BGM. Do you know Kiyomizu temple? Which is a famous temple in Kyoto, east of the Kamo River in Japan. It's not known exactly why, cats taking a leap. 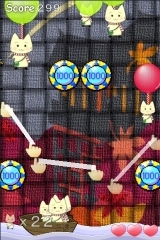 Save them by all directional Flick Reflect Bar which you can create by flick. Bound Frisky Cats will satisfy your heart. 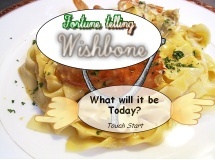 After your family enjoys a home-cooked turkey or whole chicken, have a little fun by carefully finding the wishbone and making a wish. You would stand out at a party! This is a BUBBRIS for girls version. Large bubbles, new graphics and easy settings. Many bubbles waft in the breeze. Touch, move and bust them. It is not like some typical block puzzle game. Touch and try this simple and exciting highspeed bubble puzzle. It's NEW EXPERIENCE! *Bubbles bob toward each other. *Make some pair bubbles and touch them, then you can bust it. *Bust some target bubbles and go next stage. Japanese MARIMO, So cute. 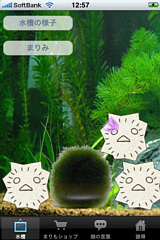 Let's breeding and training Marimo! Marimo also known as Cladophora ball, Lake ball, or Moss Balls in English, is a species of filamentous green algae found in a number of lakes in the northern hemisphere. A marimo is a rare growth form of the species where the algae grow into large green balls with a velvety appearance. Colonies of such balls are only known to form in Iceland, Scotland, Japan and Estonia.